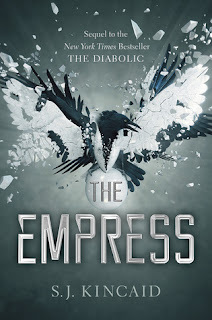 This week, my swoon is from The Empress by S.J. Kincaid! Tyrus pulled me to him, his lips hot and intent, parting mine. His hand cupped the back of my neck. The stroke of his thumb at my nape sent delightful chills skittering down my spine. His hand slid downward, and his eyes met mine before his touch traced up the expanse of my leg. He searched my face, and I realized he was gauging my response. Wanting to force him out of his head, I shoved him onto his back. Tyrus gave a startled sound, but his lips blazed into a grin as I tasted the skin of his throat... And then his legs were tangled with mine, rolling us over again, his face flickering in the warm glow of the firelight. "I love you," he told me simply. My review should be posted shortly! You must check out The Diabolic and The Empress if you have not already. The series is a great one! I need to read The Diabolic. This is swoon worthy!! What I loved the most about The Diabolic was the romance, and I think Kincaid writes swoony scenes SO well. I can't wait to read this book! I'm so excited to read this one! I love The Diabolic and I'm a little nervous about Empress because I thought The Diabolic ended perfectly. But still exited all the same. Ahh this makes me so excited! I just got the ARC and haven't read much of it yet. I'm opening up my app now and start reading it!